....Where each week, we'll share SIMCAC announcements, member spotlights, local/national industry news, upcoming events, and recaps of past ones! Please describe your current company and role. I serve as the Senior Vice President & Chief Information Officer (CIO) at AARP. AARP is the nation's largest nonprofit, nonpartisan organization dedicated to empowering people 50 and older to choose how they live as they age. As CIO, I lead an innovative and diverse team of over 500 technologists focused on enabling new technology solutions and services that help AARP members and people 50+ live their best lives. I am responsible for IT strategy, architecture, operations, transformation and information security. While running IT like a business, we are converting the IT organization from a “cost center” to a “value center,” using innovative technology to scale our mission, strengthening AARP’s Information Security infrastructure and improving IT's ability to execute. AARP was recently ranked #6 among Best Places to Work in IT. In your opinion, what makes AARP such a great place to work in IT? At AARP, it starts by attracting and retaining top talent who are looking for a dynamic culture, where there is opportunity to try new things, and grow professionally through challenging and meaningful work. We aim to be “everyday innovators in aging.” In this spirit, I consider everyone to be a leader in their own right, with their own personal and professional goals, regardless of their title or their role within AARP. I have an open-door policy and offer monthly Pop-Up Topics where staff are invited to participate in an open video conference to share news, ideas, and recognition or raise questions and concerns. I also believe strongly in continuous professional development. We have invested time and resources to provide specialized learning and training programs. During our quarterly In-Service days for all IT staff, we invite diverse and outside perspectives, explore emerging technologies, enhance our skills in new ways of thinking, and spur adoption of the most useful technology in support of AARP's mission and AARP-wide innovation. What current professional project, challenge, or opportunity are you most excited about and why? Our goal is to enhance the mission of AARP through technology. Each time we improve our ability to execute new technology solutions and services, we help AARP members and people 50+ live their best lives. As such, I am most excited about our efforts to modernize our technology and enhance the way the world interacts with AARP. We are working to modernize our business platforms with the promise of more agile architecture that can shorten our go-to-market delivery and position us to move towards the Cloud. We’re exploring business platforms that are flexible and modular and that help us to deliver more personalized customer experiences as well as offer new products and services. What is the biggest tech trend affecting your industry today? There are three areas in our industry that are very meaningful to our constituents: Health, Wealth, and Self. In the health sector, we’re seeing how virtual healthcare delivery can open wider access to care and allow physicians to monitor conditions from anywhere. Another exciting area is biometrics, such as facial recognition, fingerprint scanning, and vein matching for quicker and more secure access to medical records by authenticated physicians and healthcare providers. The promise of longevity, along with our desire to live independently, leads us to explore the intersection of robotics, artificial intelligence, voice-assistive technology, and machine learning. These technologies hold a lot of promise for overcoming isolation, enabling more in-home assistance, empowering people to age in place, and providing more assistive mobility solutions. In an age where security breaches and fraud are becoming commonplace, technologies like blockchain are paving the way for greater protection of personal and financial information, as well as the prevention of data tampering. At AARP, we have a steadfast focus on disrupting the conversation around aging and exploring how we can bring technology-enabled solutions to market. You were recently nominated as a Nonprofit/Public Sector Finalist for the 2018 Capital CIO of the Year ORBIE Awards. Can you tell us a little bit about the award and what it means to you? The Capital CIO of the Year ORBIE Awards is a technology executive recognition program for chief information officers who have demonstrated excellence in technology leadership. As a Nonprofit/Public Sector Finalist, I feel privileged to share this honor with the AARP Information Technology Services (ITS) team. I’m proud that our collective passion for harnessing technology to drive the AARP mission is being recognized by the industry. Outside of work, what endeavors are you most excited about today? Could be some sort of volunteer work, involvement in SIM, hobbies, etc. I have a passion for science, technology, engineering, and math (STEM) and strongly advocate for how industry can support and empower more women in technology. Within AARP, I sponsor the Women’s ITS Leadership Alliance (WILA), which organizes panel discussions, speaker series, book clubs, and networking events. Outside AARP, I serve as a Committee Chairman for Boy Scouts of America, one of the nation’s largest and most prominent values-based youth development organizations. I’m also a member of the American Indian Science and Engineering Society, a nonprofit organization focused on substantially increasing the representation of indigenous peoples of North America in STEM studies and careers. I also remain active in my sorority alumna community, which focuses on volunteerism and gerontology. Either within or outside AARP, I am deeply committed to organizations that promote the personal development and professional growth of our future leaders. What is the most beneficial part about being a SIM/SIMCAC member? The most beneficial part of SIM/SIMCAC membership is being able to tap into a community of thoughtful and accomplished peers who are willing to take your call, share their insights, offer new ways for approaching challenges, and will drop everything to help in your time of need. SIMCAC members are truly invested in each other’s success, which is a value that’s hard to find in other professional organizations. 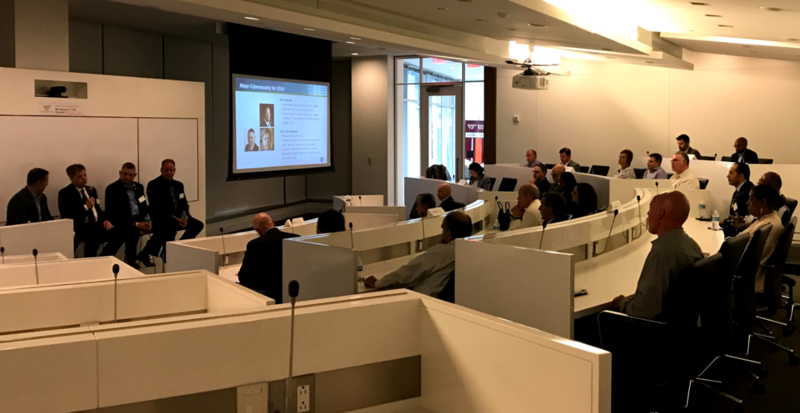 Event Recap: "Major Cybersecurity Trends for 2019"
On Monday, October 1, 2018, SIM gathered its prospective members, current members, board members, and signature sponsors alike at the Virginia Tech Research Center to dig deep in to major cyber security trends for 2019. It was clear as attendees filed in that, as we know, cyber impacts every sector. All eagerly awaited the chance to share and grow! To facilitate the conversations, three guests were welcomed to the panel: Dave Simpson, John Brady, and Michael Dent. Their combined backgrounds cover a vast scope from homeland security, to local government, to regulatory infrastructure.Not surprisingly, much of the conversation revolved around data protection. One panelist conveyed this with a story of a phishing training roll out. A suspicious looking email went out and when clicked on, it directed the user to cyber security training on detection and proactive responses. A c-level leader called the director responsible for the training annoyed and wanting to know “why do we have to do all of this nonsense?!”. His response: “Sir, because you clicked.” What would it look like if top level leaders took cyber in to high level investment conversations? Key business strategy? Company culture build out? 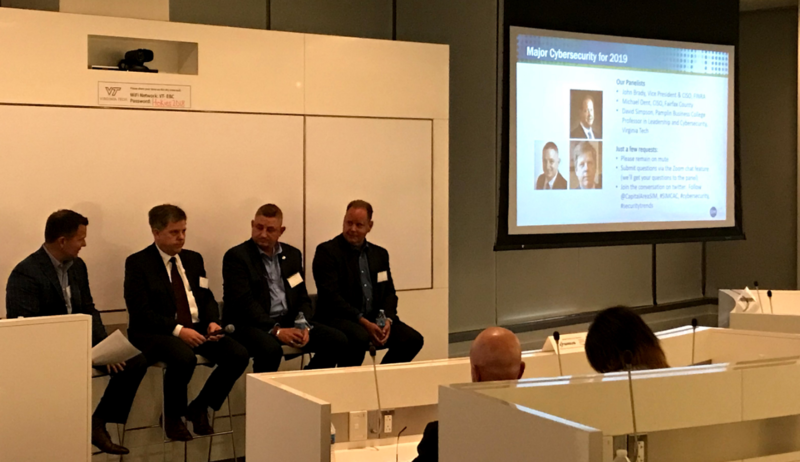 The takeaway here was shared through multiple examples of how the cyber world has and will grow at a rate that far exceeds regulatory influence or legislation. The question for us then is how we will choose to self-regulate. 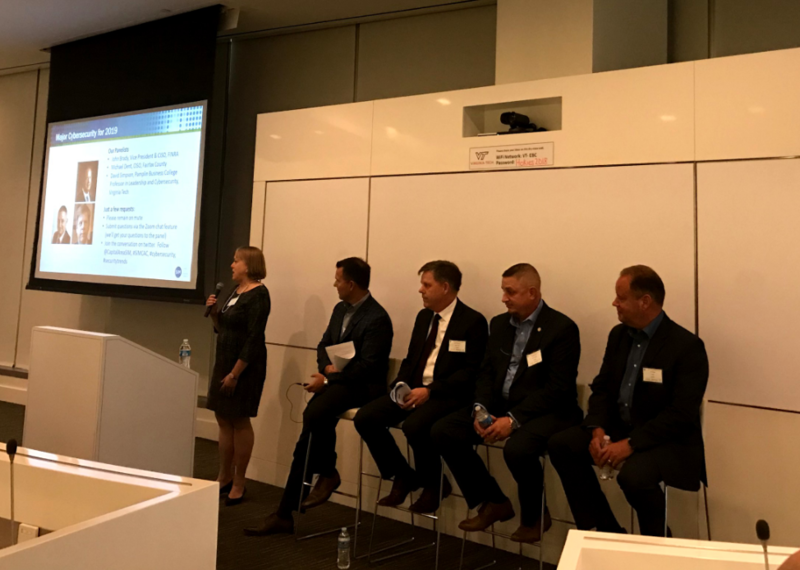 Panelists wondered what our cyber security landscape would look like if developers would further prioritize security over the race to constantly release new features. What if it was a first thought instead of an afterthought? The conversation did wonder on to the ever-hot topic of cloud storage and more. In every interaction it was evident that even when there is not a perfect answer, SIM members support each other in exploring the best solutions for our organizations. 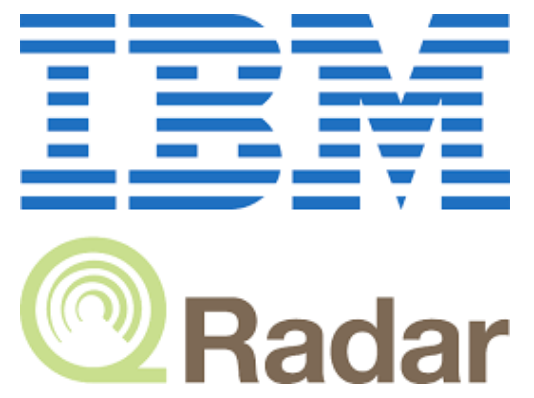 Special thanks to Sirius and IBM QRadar for making this event possible. Topic: Identifying and Living Out Your Brand! In today’s workplace, women are leaders, empowered and making a difference in the environment. Yet still, many women do have challenges being heard, standing in the power of their role, and defining exactly who or what they want to become. Join your peers to enjoy a time of fulfilling and inspiring discussions, stories and guidance. Attendees are encouraged to attend with their direct reports to take advantage of this development opportunity. Leadership Coach and Corporate Culture Strategist, Tiffany Houser, will be on hand to deliver some key points to empower this part of your career journey. As your gift for attending this leadership event, Tiffany is offering a 15-minute complimentary coaching session with her, over the phone, to dive deeper into your leadership goals. Sign-up for time during the breakfast. Tiffany Houser - As a leadership coach and culture strategist, Tiffany Houser has over 18 years experience working with tech companies and tech professionals. 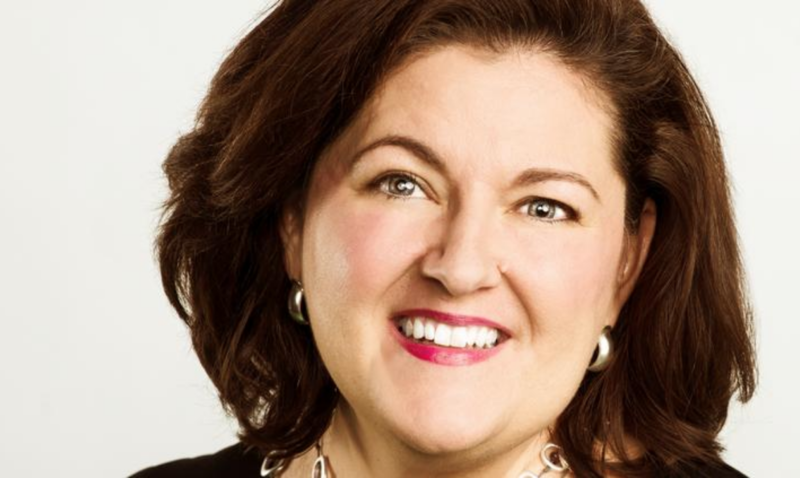 Her work allows aspiring leaders and professionals to step into their professional purpose so they can fully engage in the work they passionately love while creating an impact and elevating their leadership. The work includes breaking through your mindsets that are holding you back to clear the way for you to become and inspiring leader in tech. With her culture transformation work, Tiffany and her team of inspiring and empowering coaches and leaders collaborate with your senior leadership to define your thriving culture and bring it to life with the 4 cornerstones of her work - insight, emotional intelligence, inspirational leadership and impact. Tiffany and her team also produce and facilitate corporate retreats and workshops, and are available for speaking engagements. To find out more about Tiffany Houser, please check out her site and her LinkedIn profile. One of the most valuable programs within SIM is the Regional Leadership Forum (RLF). Below is a message from Madeline Weiss, Mid-Atlantic RLF leader. We encourage all to read this message and give serious consideration to identifying a high potential member of your team to attend RLF. As leader of the Mid-Atlantic RLF, I’ve had the pleasure of working with over 500 IT leaders who have been enrolled in the program. Participants regularly come from such Mid-Atlantic organizations as Armstrong World Industries, Federal Emergency Management Agency, Chubb Insurance, Carestream Health, Constellation Brands, Aetna, Bristol-Myers Squibb, International Monetary Fund, InterAmerican Development Bank, Johnson & Johnson, FINRA, NASA, Computer Aid, Air Products, Dollar Financial Corp, Howard Hughes Medical Institute, Campbell Soup, AARP, and Arkema. "You have been a great guide for us along this journey. I am so grateful to have had this opportunity to meet my fellow RLF classmates, to learn from the guest speakers, and to forge relationships with them both. This has been a life-changing experience for me personally and professionally, and I thank you for that. I am no longer afraid to take a seat at the table." "I have grown measurably in my ability to look at my strengths, abilities, and even weaknesses, to become a better husband, father, manager, co-worker - and most importantly - leader!" "Thank you for the opportunity to stretch, dive deeper into who I am, and sharing your wisdom and feedback. This journey has truly helped me with balance and I'm in a very happy place in my life." "The RLF program has opened up my way of thinking and helped me grow professionally. I always want to be challenged and this class has given me that opportunity. I now have 26 new friends and a great network of new people." "You have been phenomenal in leading all these sessions. Very thought provoking and engaging. I learned a lot in the process." "Thank you so much for leading us on this wonderful journey. One of my key learnings is that I can have a positive impact on those coming behind. It's been a truly fabulous experience." "You truly inspired me to be better and accomplish more." "One of the many things I learned during RLF that will stay with me is to never be afraid to try something new. By trying, we stretch our minds and open ourselves to new possibilities and realities." A description of the program is in the attachment to this email. You can register participants for the Mid-Atlantic RLF at: https://www.simnet.org/event/2019_RLF_MA. If you register now, you can take advantage of the early bird discount ($500) and the SIM member discount ($600). 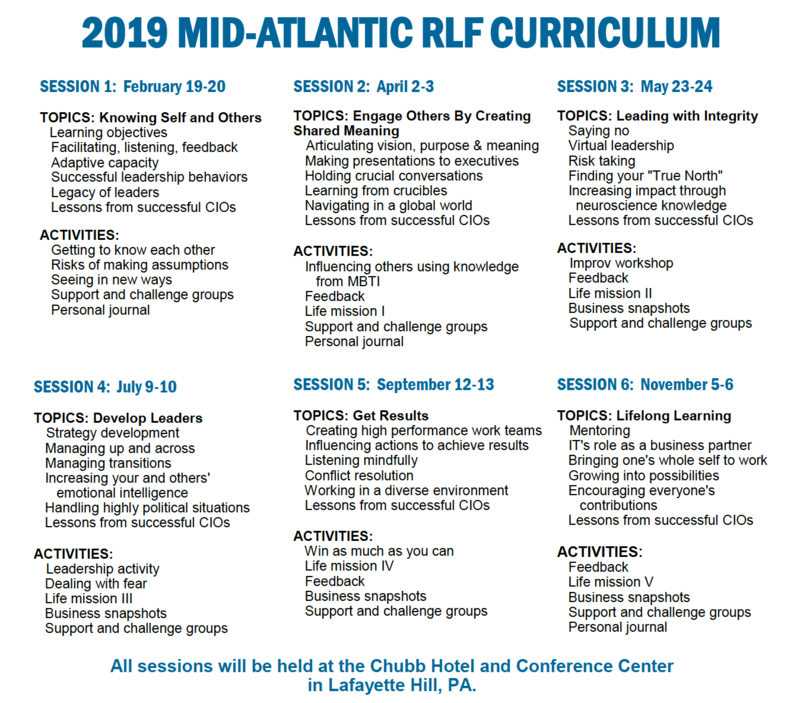 Although the program doesn't begin for a few months, the Mid-Atlantic RLF fills quickly.